Have you noticed recently just how many gadgets we all have that need seemingly constant charging and re-charging? Cellphones, laptops, mp3 players, digital cameras, and now even books need to be charged regularly so we can happily go on using them. Carrying around a charger for all of these items is not only cumbersome but also impractical when you consider the issue of having to find an outlet to plug the charger into. RCA is preparing to market the latest solution: a sleek, pocket-sized wireless charger. 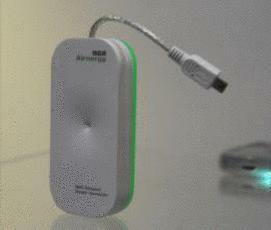 The “Airenergy” uses wireless electricity from radio frequencies in the air to charge your various gadgets via USB port. During Airenergy’s unveiling at the Consumer Electronics Show in Las Vegas, one company spokesperson claimed the device tohave charged a Blackberry with only 30% charge to full battery in just 90minutes, and of course, this was all without the use of an outlet. The prototype is a small, compact device that uses anantenna to absorb energy from radio frequencies and then converts that energyinto DC power. These energy sources comefrom seemingly mid-air, using free electricity from ambient Wi-Fi signals. What’s more, the device charges itself twenty-four hours a day given the device is in the vicinity of a Wi-Fi source. Thus, if you have a Wi-Fi connection in your home, your device could be charging itself while you sleep and all the while not affecting your electric bill like a regular charger would. The device is expected to be released for around $40 a piece sometime this year. Perhaps this free air-energy can be applied to other uses some day! Cars, Boats, Planes, Homes, Hotels, offices, etc etc. Radical IF doable & upscale for other apps. I was thinking along those lines as well. Other small scale technologies may have similar applications using radio frequencies. It's not the most practical way to go, but in a pinch (such as if your phone dies during an important event), it could be feasible to use something like this. This sounds like a much-needed and sustainable technology. Can't wait till it's on the market.